Is your home, garage or business overflowing? 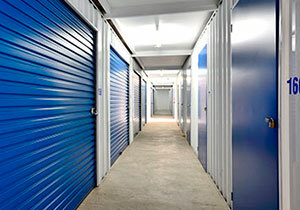 An indoor self storage unit is the perfect solution to extend your space. Indoor storage sheds can be small, or as large as their outdoor alternatives. Interior unit doors are protected from severe weather, making it a more positive storage experience if it’s raining and you’re not getting wet! It is of course, critical to ensure your goods are not damp when they are put into storage. Most storage units don’t have internal light s. You rely on light from the corridors, or in the case of a drive-up/external unit, natural light from the open shed door. With internal storage units, you can take your time going through your stored items without worrying about the weather turning nasty, and rain coming in through the open door. Likewise, poor visibility needn’t be a problem if you are accessing your storage locker at night. Interior units have corridors that provide cover and lighting. At Gateway Storage, we offer internally accessed self storage lockers, and external Yard space for vehicle storage such as boats, trucks, campervans/motorhomes, caravans and other vehicles.